Just like fellow tech billionaire entrepreneurs, Bill Gates and Mark Zuckerberg, Larry Ellison is a university dropout who went on to make a fortune through his company, Oracle Corporation, with a focus in the development and marketing of database software and technology. The Oracle Corporation chairman and chief technology officer also serve as a non-executive director of Tesla Inc. Join us as we take a look at the life of the man who as of June 2018, according to Forbes, is the tenth-wealthiest person in the world. On the 17th of August, 1944, in the New York City borough of The Bronx, Lawrence Joseph Ellison was born to a single Jewish mother, Florence Spellman. Other than the fact that Ellison’s biological father was said to have been a United States Army Air Corps pilot of Italian descent, nothing else is known about him. This meant he was left to be raised by just his mother who had a difficult time doing so. When Larry Ellison was about nine months old, he suffered from a severe bout of pneumonia that prompted his mother to send him away to be catered for by her aunt and uncle; Lillian Spellman and Loius Ellison, who lived in the Chicago area. The couple later legally adopted the baby and raised him in the middle-class neighborhood of Chicago’s South Shore community. As a child, Ellison displayed a very good understanding of science and mathematics as he excelled in school. After completing his high school education, he enrolled at the University of Illinois at Urbana-Champaign where he was named science student of the year in his freshman year. In his second year, however, following the death of his adoptive mother, Ellison dropped out of school. He tried to return to school a year later, this time at the University of Chicago, where he managed to stay for only one term before dropping out again. By this time, he encountered a computer design which he became fascinated with as it went on to define his career path. Following his decision to abandon college, Larry Ellison opted to leave the mid-west for Northern California, where he worked for companies such as Amdahl Corporation, Wells Fargo, and Ampex Corporation before he and two other friends founded the company, Software Development Laboratories (SDL) in 1977. In 1979, SDL renamed itself to Relational Software Inc. before later changing to Oracle Systems Corporation in honor of its flagship product, the Oracle Database, in 1982. Oracle Systems Corporation grew to enjoy huge success in the coming years although it was occasionally threatened with bankruptcy due to poor or overzealous approaches to business. Larry Ellison went on to become a driving force in the tech world as he further succeeded in business to become one of the wealthiest people in the world. According to Forbes, Larry Ellison, as at the end of 2018, has a net worth of $58.5 billion. 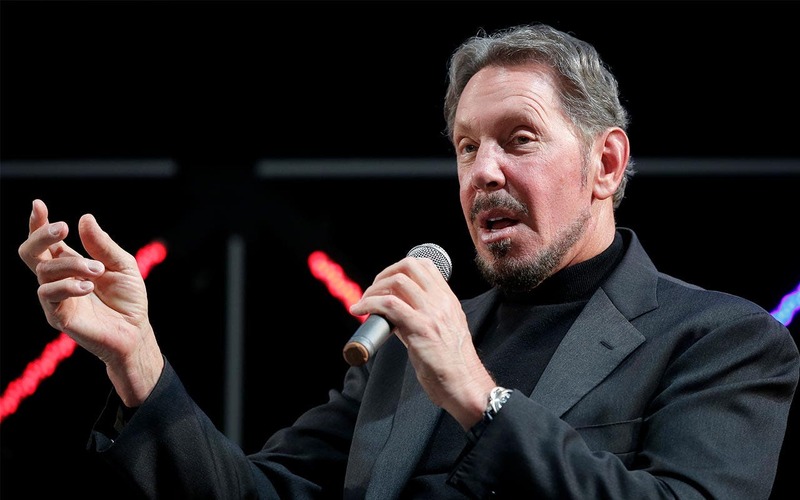 He made most of his wealth through his involvement with Oracle where he holds or once held the positions of executive chairman, chief executive officer, and chief technology officer of the company. He is further involved with other companies such as the wellness startup called Sensei, which is looking to begin hydroponic farming on the Hawaiian island Lanai. Thanks to Ellison’s enormous wealth, he has been able to afford himself an extravagant lifestyle that includes being a licensed pilot and owning several aircraft, including two military jets, one of which the US government has refused to grant him permission to import. He further owns a number of choice properties all across the United States, including the aforementioned Hawaii island of Lanai, which he bought in 2012.
Who is His Spouse, Wife or Girlfriend? Larry Ellison has been unable to replicate the type of success he has enjoyed in his business in his personal life, as he has been married and divorced four different times. His first marriage to Adda Quinn in 1967 lasted for seven years before ending in 1974. His next marriage, which was to Nancy Wheeler Jenkins, lasted just one year, from 1977 to 1978. Ellison waited a few years before trying again, this time with Barbara Boothe, who used to work as a receptionist at Relational Software Inc., in 1983. He famously presented her with an 11-page prenuptial agreement just before the wedding ceremony, which almost resulted in the ceremony being called off. The pair, however, went ahead to get married and welcomed two children; David and Megan Ellison, before divorcing three years later in 1986. Larry Ellison again backed away from the marriage scene for a few years before choosing to try again with romance novelist Melanie Craft in 2003. The duo divorced in 2010. He has since then begun dating actress and model Nikita Kahn.